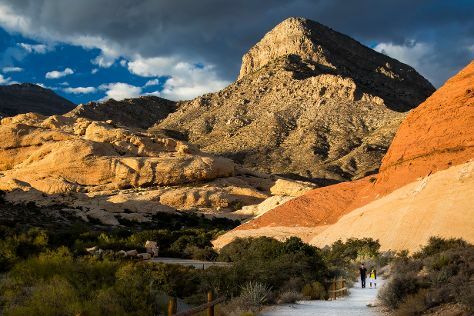 Take a break from the city and head to Red Rock Canyon National Conservation Area and Valley of Fire State Park. Explore the numerous day-trip ideas around Las Vegas: Green Valley Range (in Henderson) and Hoover Dam (in Boulder City). Spend the 20th (Wed) riding across the waves with a waterskiing or jet-skiing adventure. The adventure continues: admire the local landmark of Bellagio Fountains, see the interesting displays at The Mob Museum, try to win big at Bellagio Hotel and Casino, and take in nature's colorful creations at Bellagio Conservatory & Botanical Gardens. For where to stay, other places to visit, maps, and tourist information, you can read our Las Vegas tour itinerary planner. Amritsar, India to Las Vegas is an approximately 22.5-hour flight. You can also do a combination of train and flight. You'll gain 13 hours traveling from Amritsar to Las Vegas due to the time zone difference. When traveling from Amritsar in March, plan for a bit cooler days in Las Vegas, with highs around 27°C, while nights are about the same with lows around 13°C. Cap off your sightseeing on the 22nd (Fri) early enough to travel to Grand Canyon National Park. Escape the urban bustle at Grand Canyon South Rim and Rim Trail. On the 25th (Mon), hike the day away at Bright Angel Trail. There's still lots to do: trek along South Kaibab Trail, head outdoors with Shoshone Point, don't miss a visit to Grand Canyon Village, and tour the pleasant surroundings at Tonto Trail. To see reviews, other places to visit, and more tourist information, read our Grand Canyon National Park online day trip planner . Do a combination of car and flight from Las Vegas to Grand Canyon National Park in 4.5 hours. Alternatively, you can drive; or take a shuttle. Due to the time zone difference, you'll lose 1 hour traveling from Las Vegas to Grand Canyon National Park. Traveling from Las Vegas in March, you will find days in Grand Canyon National Park are little chillier (16°C), and nights are colder (-5°C). Cap off your sightseeing on the 29th (Fri) early enough to travel to San Francisco. Visiting Alcatraz Island and Presidio of San Francisco will get you outdoors. When in San Francisco, make a side trip to see Muir Woods National Monument in Mill Valley, approximately 46 minutes away. There's still lots to do: take in the views from Golden Gate Bridge, take a leisurely stroll along Fisherman's Wharf, buy something for everyone on your list at Ferry Building Marketplace, and make a trip to Golden Gate Park. For ratings, where to stay, traveler tips, and more tourist information, use the San Francisco trip planner . You can do a combination of bus and flight from Grand Canyon National Park to San Francisco in 8.5 hours. Alternatively, you can do a combination of shuttle and flight; or drive. The time zone changes from Mountain Standard Time (MST) to Pacific Standard Time (PST), which is usually a -1 hour difference. Expect a bit warmer weather when traveling from Grand Canyon National Park in March: highs in San Francisco hover around 21°C, while lows dip to 11°C. On the 4th (Thu), wrap the sightseeing up by early afternoon so you can travel back home.